The club was 80 years young in 2011. A great party and fun night to celebrate this milestone was held. The members were looking forward to our centennial celebrations. 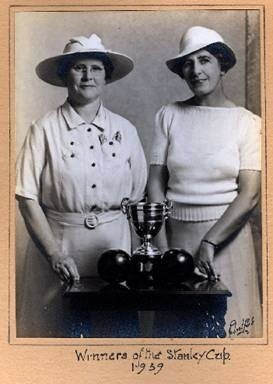 In the late twenties, a few enthusiastic members of The Lake Hill Community Centre came up with the idea of forming a lawn bowling club. Hence, the seed was planted and the volunteer members worked diligently to make their dream a reality. 1931 In January 1929 Saanich Council decided that the space at the South East corner of Reynolds Street Property should be reserved for a bowling green and the sum of $1500.00 was set aside. On April 23, 1931, it was the decision of the Council that a communication be forwarded to the Community Centre requesting them to take over the bowling green at the Lake Hill Recreational Park, now Reynolds Park, for the next 5 years at a rental of $1.00 per annum, and that a grant of $200.00 be made from the Parks funds. Eleven members of the Lake Hill Community Centre formed the Lake Hill Lawn Bowling Club. Fees were agreed at $5.00 annually for men and $2.00 for Ladies. The members agreed to pay five years in advance to provide operating funds. 1932 On April 14, 1932 the first General Meeting of the Club was held at the Community Centre. It was decided to purchase a lawn mower costing $45.00 and the Club was to be affiliated with the Greater Victoria Lawn Bowling Association, fee $1.00 plus 10 cents per capita. Tenders were called from paid up members for greens keeping. The Lake Hill Community Centre rented the green to the Club for $1.00 per annum and purchased all equipment up to $50.00. On June 4, 1932 the green was officially opened having allowed sufficient time for the green to be in playable condition. 1933 Club House was built by volunteer members and served the club well for over 70 years. 1934 First Annual General Meeting held in the Club House. 1937 Special game was played on Coronation Day, May 12. This tradition has been carried on with special games on Canada Day and BC Day. 2000 Jim Waring lead a team later to include Linda McClung, Al Seward and Roger Vale, to replace the 1933 portion of the clubhouse. 2009 Finally after 9 years and many proposed schemes the Clubhouse was demolished and construction started to build a new Clubhouse, with funding provided by the Saanich Municipality, the BC Gaming Commission and the generous donations by club members. 2010 New Club House was completed, and had a Grand Opening on June 5th, 2010, to the delight of all club members. 2013 Lake Hill Lawn bowling club rebuilds back to its original membership and then some. For the first time on Canada Day Holiday tea all greens were full of players with 6 shifting after tea. Our club is now seeing full membership and with that a new vibrancy. We look to a great future for our club, and many wonderful times to come.